This message aims to help pilots become more aware of our gliding activity and is based on Aeronautical Information Circular (AIC) Yellow 083/2011 linked from the NATS Aeronautical Information Service website. That AIC is highly recommended reading! Gliding is a weather dependent air sport and although most active from March–October the activity takes place throughout the year during daylight hours. 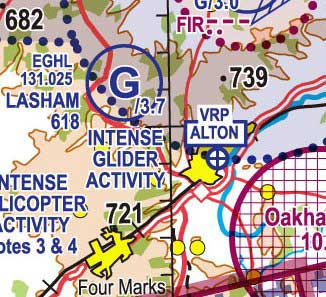 The vast majority of gliders launch from sites clearly marked on half and quarter mil maps. In the UK, the longest single flight distance is 1100km, gliders routinely fly closed circuit 300 km cross country flights at average speeds of around 100 kph and gliders routinely climb above FL100 near mountains and hills. There are around 7000 glider pilots operating some 2300 gliders at 86 clubs flying around 130,000 hours and covering about 1M kms per year. In addition, our Air Cadet colleagues carry out a huge amount of training in winch and self-launched gliders from a number of sites throughout the UK. How to See and Avoid? This puts a real premium on effective lookout technique (CAA Safety Sense Leaflet No 13). However gliders rarely fly wings level for long periods and when manoeuvring they become easier to see. A significant number of gliders are equipped with FLARM, an electronic aid to effective lookout that provides visual and aural warnings of closing traffic that is equipped with the same technology. This relatively low cost equipment has to date been almost exclusively fitted to gliders – but can be fitted to any aircraft. The RAF are fitting FLARM to some of their aircraft. The recent development of Powerflarm allows any aircraft to detect both FLARM and transponder equipped traffic on a single instrument. Is to avoid glider sites at all times. Only overfly them if you have timely, positive confirmation from the site itself that they are inactive. When avoiding glider sites, beware of simply skirting the ground location by a narrow margin because there are likely to be gliders operating close to the site as they soar within gliding range. Even if a site has finished winch-launching for the day, it may have gliders returning from cross country flights, or motor gliders self-launching into the local area. Pilots should not rely on seeing the winch launch happening as they approach the glider site. A glider will go from ground to 1,000-1,500ft in about 20 seconds, so spotting it in the climb is too late to do anything about the conflict. Nor is the danger passed once the glider is released from the winch. Pilots unlikely to see the cable itself and, depending on the winch-launch height, the hazard from these continues for at least another 20-30 seconds as it descends under a small parachute that is effectively invisible. Some glider sites are capable of launching to altitudes of 3-4000ft, with associated increased cable descent times. 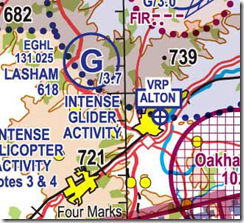 Maximum launch altitudes are indicated on the 500K VFR chart with a forward slash and height. Lasham, for example (right), has a maximum winch-launch altitude of 3700ft, as shown on the attached graphic as /3.7. So far, we haven’t seen an actual mid-air, either between a para glider helicopter or fixed wing aircraft or with the descending winch cable. But it could soon be a matter for the AAIB rather than UKAB. Consider fitting an electronic aid to effective lookout that is FLARM compatible.